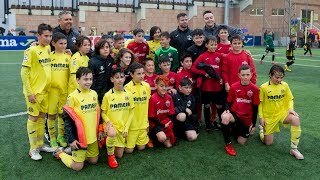 Four Villarreal teams were in action this weekend, with the majority of ties being called off due to the red alert due to extreme rain. As well as a the hard-fought point Villarreal CF gained against Atlético Madrid, there were impressive draws away from home earned by Villarreal B and the U19s (Juvenil A) against Barcelona B and Valencia respectively. The only win of this weekend for a Villarreal side came from the Ladies' first team, who came away from the provincial derby against Joventut Almassora with a 3-1 win, maintaining their unbeaten start to the season.